Hi folks! I have pictures of the share contents for Week 2. 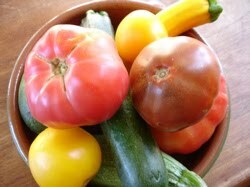 To avoid forgetting to take the pictures, I photographed the produce pre-wash, so you’ll notice soil on the veggies. They’ll be nice and clean when you pick them up, of course. But it’s always good to give them another cleaning before you use them. The only thing we don’t wash at the farm are the strawberries, as they should only be washed right before eating them (to maintain their “shelf” life). I also just printed out this week’s newsletter. You can expect more in this newsletter compared with last week. This week we’ve included Michele McKinley’s description of Farm It Forward, an idea Ben and I approached AHA (Advocates for Health in Action) in February. We’re having our first fundraiser this Sunday at Market Restaurant. For more info on that, please see the preceding post. We’ve also include some basic information (storage and cooking instructions) to help members make good use of your weekly shares. We’ve highlighted bok choy, rainbow chard, lettuce and dill. And finally, Ben wrote a little segment we’re calling “Farmer Musings” to let members know what’s going on here on the farm. We hope you find the newsletters helpful. Okay, now, for the pictures! Here’s a regular/small sized share. Everything is pictured here but the chard and the herbs. 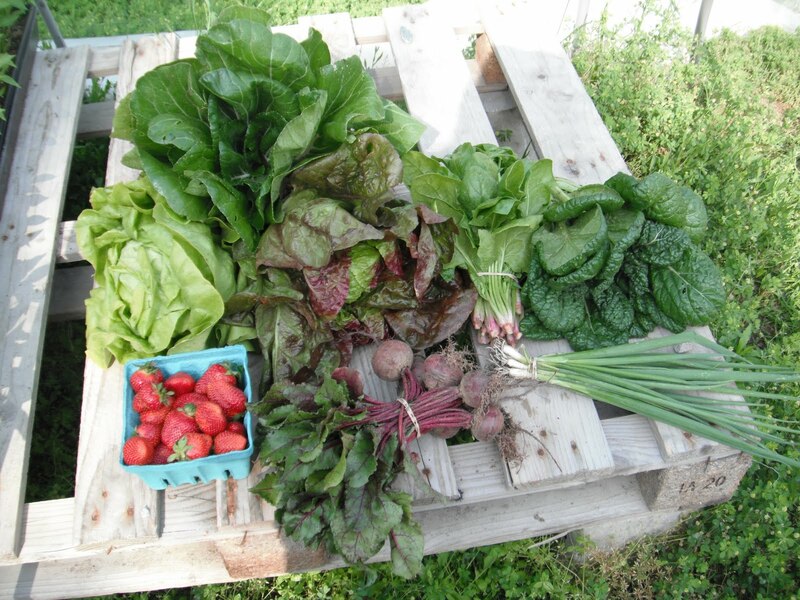 Items in this weeks share include: strawberries, bok choy, tatsoi, beets, dill and cilantro, lettuce, spinach and scallions. This is a green bib, called Nancy. 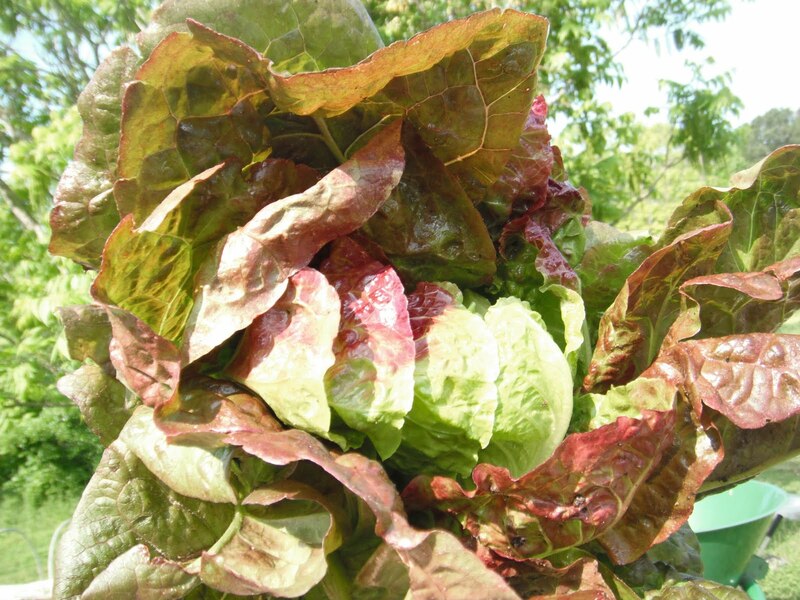 This is a red romaine, called Marvel the Four Seasons. A recipe for tofu stuffed lettuce rolls is in the newsletter. Bok Choy. The newsletter includes a recipe for Stir-Fried Bok Choy with Cashew Sauce. Spinach. We like to steam it all and eat it with eggs for breakfast. These are scallions. 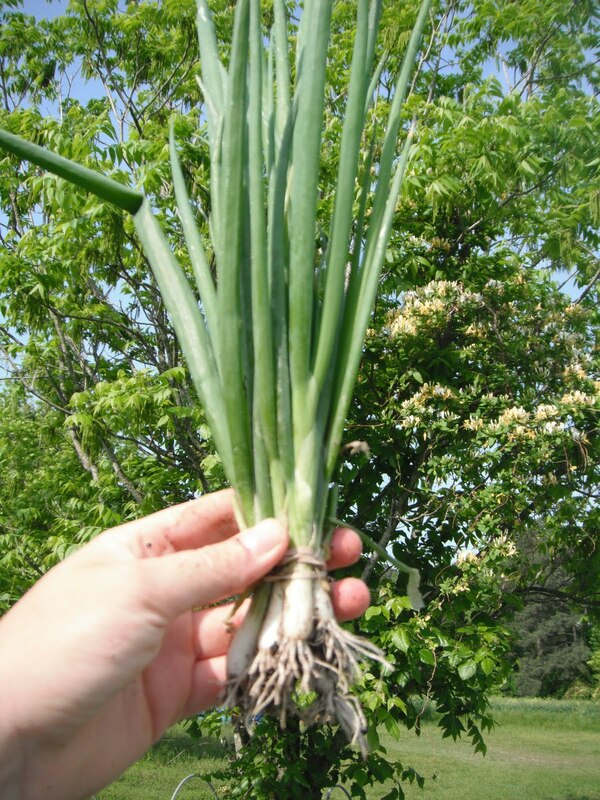 The difference between scallions and green onions, is that green onions are basically baby (bulbing) onions, while scallions will not bulb. 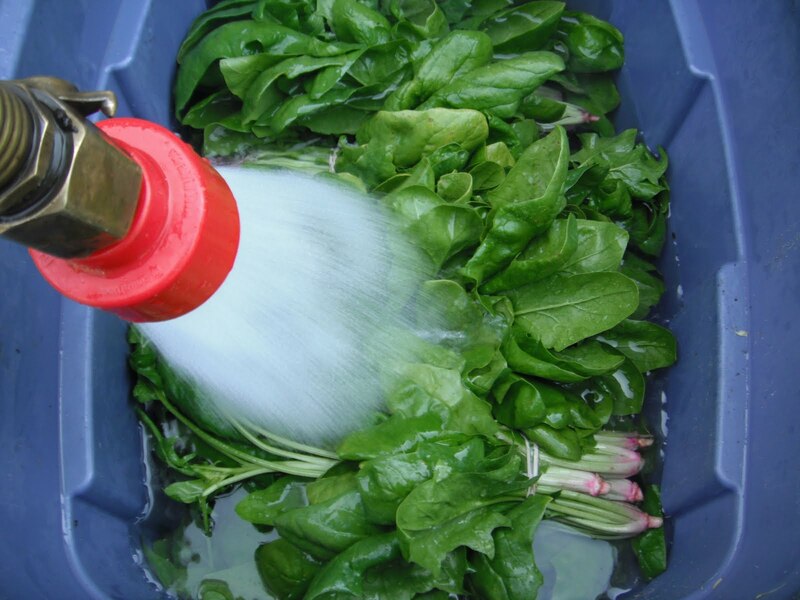 You can steam or saute the beet greens too! 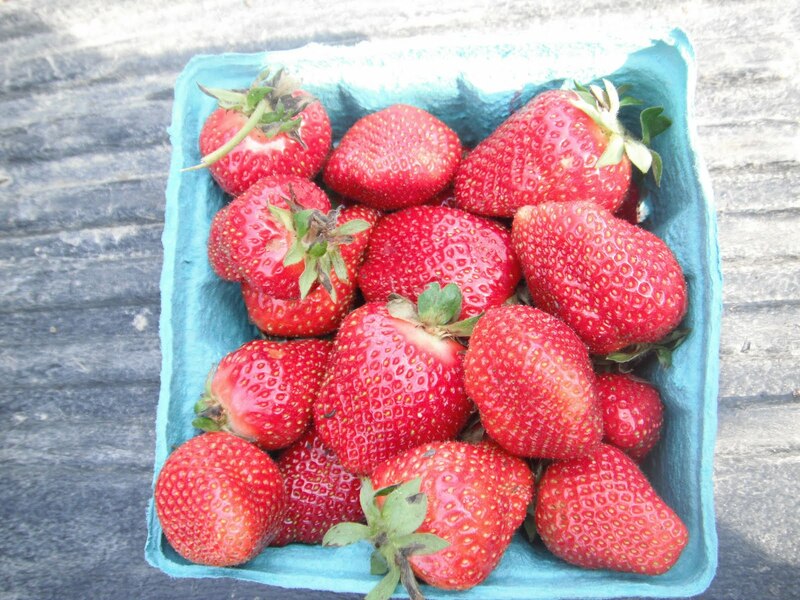 Yummy, yummy strawberries! This variety is called Chandler. Here’s Ben about to wash all of the produce. This week I completely forgot to get a picture of the Rainbow Chard, but I think y’all know what it looks like. 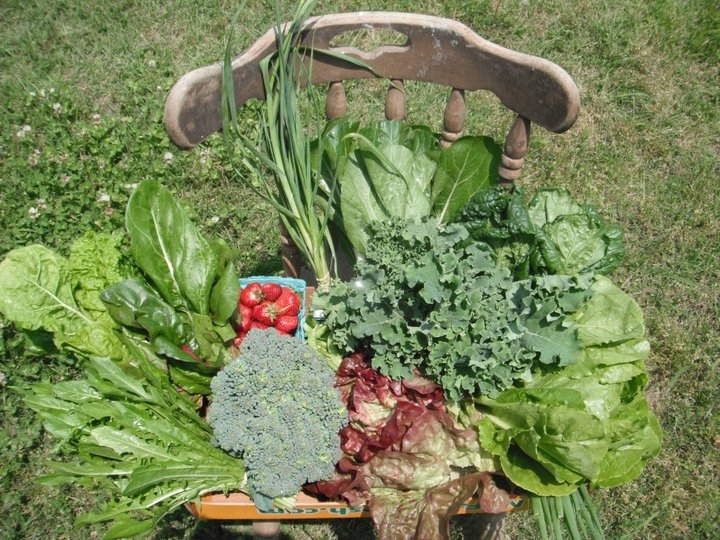 And if you forgot, you can always check the Week 1 CSA Share post. We included a recipe for Swiss Chard Gratin in the newsletter. Well, I suppose that’s it for now! If you have any questions or suggestions for how we can make your membership experience better, please feel free to send us email or give us a call. Also, we would really love it if members would contribute some recipes of your own so we can share them with everyone. Thanks for stopping by! Ben will see you at the pick ups and at market. I’m MIA for the time being, working on my doctoral exam (prelim) for global sociology. I take the exam Monday, May 16th. After that, you’ll be seeing my face around a whole lot more! Ben told me a lot of folks from market wished me luck – thank you! I can certainly use it! P.S. If you know folks that are interested in joining a CSA and you are happy with us, please let them know we are still accepting CSA members. We will prorate new members to account for missed pick ups. Glorious Greens! – They sure are pretty, but what do I do with them? So, the fall and winter seasons bring us lots of greens and lots of root vegetables. If you don’t know what to do with them – and they’re really quite versatile and easy to put in just about everything – they can pile up on you and make you feel like your bounty is a chore. This is the last thing we want folks to feel about their weekly produce shares, so I’m getting on the ball and getting to some of the recipes I find useful and inspirational. But I do need to let you know, that once you begin on the greens journey, you’ll realize how extremely easy cooking and eating greens can be – and it’s tasty and nutritious too! Nutritional information: High in beta carotene, vitamin C, potassium, some B vitamins, and fiber. 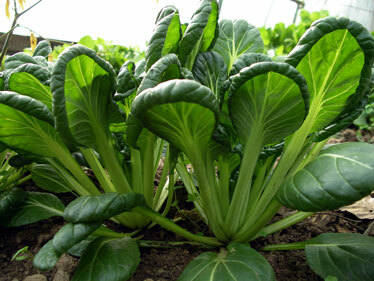 To cook: Heading cabbages can be treated much like green or red cabbage; bok choi can be used like chard. All Chinese cabbages are good in stir-fries and soups; braised, with or without meat; pickled (as in kimchee). 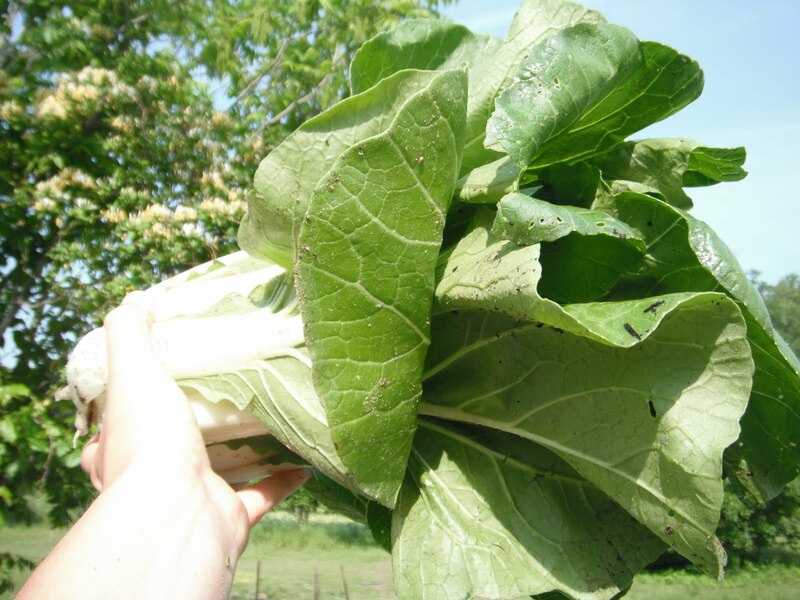 Young Chinese cabbages, or the tatsoi variety, are excellent in salads. 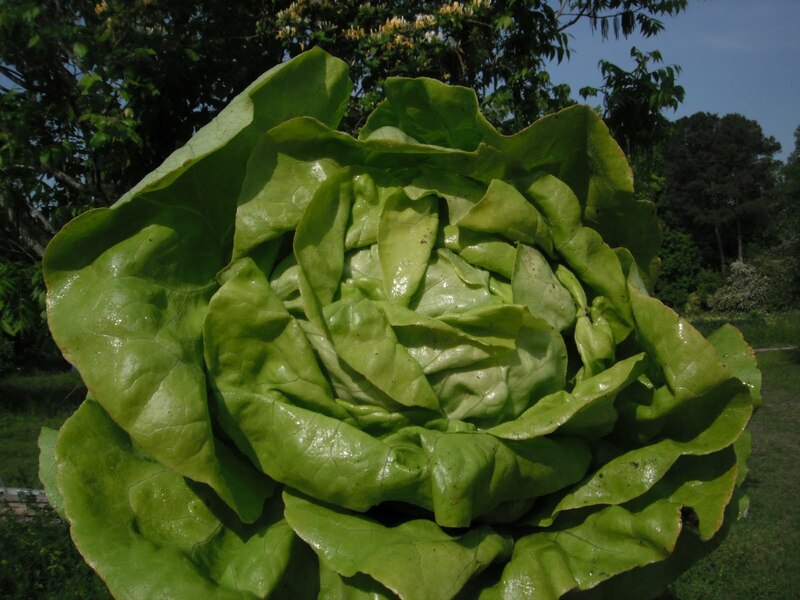 Substitutes: For bok choi, chard, which is close enough for most purposes; for the heading cabbages, common head cabbage; for tatsoi, young mustard, arugula, or cress. Now, let me just tell you that you will figure out that you can substiute tatsoi for a lot of other things than Mark suggests above. I think it’s a great substitute for spinach as well. I think the best way to figure out what you’d like to do with your greens is to try them raw and to try them braised with a little salt and pepper. Once you taste them in these two purist forms, you can decide on what types of flavors your palate is comfortable combining them with. Just to give you an idea of how easy it is to eat greens, I’ll tell you what I did for breakfast this morning. First, I chopped up the turnip roots into diced pieces (two bunches worth). I let them simmer on low in a dollop of butter and a sprinkle of salt. As those simmered, I chopped the turnip greens and then added them to the pan. Then I placed a lid over the pan so the veggie juices would help cook the turnip roots and the greens (and it’s always good to salt your greens as you place them in the pan – it helps wilt them and it disperses the salt more evenly when they’re uncooked vs. cooked and bunched). In the meantime, I then chopped up one head of tatsoi and added it to the pan. Like spinach, it takes up a lot of pan space at first but then it wilts down quite a bit. I then put the lid back on the pan (this is a medium-sized typical frying pan – all metal). I then chopped up one head of bok choi. Okay – hold on. So, what’s the count so far? Right now, we have two bunches of turnips, one head of tatsoi, one head of bok choi and a small dollop of butter. That sounds like A LOT of greens, and I suppose it is, but it really all does wilt down to a manageable bunch of greens. Okay, so back to the pan. Basically, I added all of the chopped greens in increments, so they all had time to wilt. Once all the greens were sufficiently wilted, I added 4 whisked eggs into the pan. I then let those eggs cook for about 4 minutes on low. In the meantime, I got out the block of sharp, white cheddar cheese and grated it over the top of the eggs. Finally, I turned the oven on to 350 degrees and placed the entire pan in the oven. I am a terrible omelet maker, so I do my egg omelets, fritata style (it sounds fancy, but it’s really just a lazy person’s omelet as far as I’m concerned). To be honest, I’m not sure how long those eggs were in the oven – somewhere between 5 and 10 minutes. The goal, of course, is to make sure you cooked it long enough to cook the eggs through (unless you like your eggs a bit wet, in which case, I suppose that’s not your goal…). Anyway, you should be able to see whether the eggs are cooked to your liking. If the visuals are uncertain, you can always just poke at them to feel their texture – but don’t burn yourself! Once the dish is cooked to your satisfaction, take it out of the oven and scoop some out, add a little salt and pepper (or any condiments you usually eat with your eggs – I’m a fan of hot sauce, but I know some folks really like ketchup on their eggs) and enjoy! 🙂 Whew! That sure does sounds like a lot of work (and food – but there are not usually any left overs in our house, but when there are we just reheat them for lunch or the following morning’s breakfast) when I look at what I typed, but the whole process takes me less than 20 minutes and I listen to the news on NPR and drink my morning coffee as I cook. I also make the chickens’ breakfasts as I prep our food. They like pretty much every vegetable we chop up and give them (all but eggplant, peppers, and onions), so it’s nice to feed them the things I would normally toss in the compost bin. Okay, so that’s one idea :). I’ll leave you with some other recipes, written by the experts who aren’t nearly as long winded as myself. These recipes call for particular greens, but you can substitute them for others. I use tatsoi and spinach interchangeably. I even cooked chopped turnips and greens and bok choi and put them in a white sauce lasagna for our CSA potluck/Oktoberfeast. It was a hit and I don’t think anyone realized they were eating something so “exotic” as Asian greens in their lasagna :). 1. 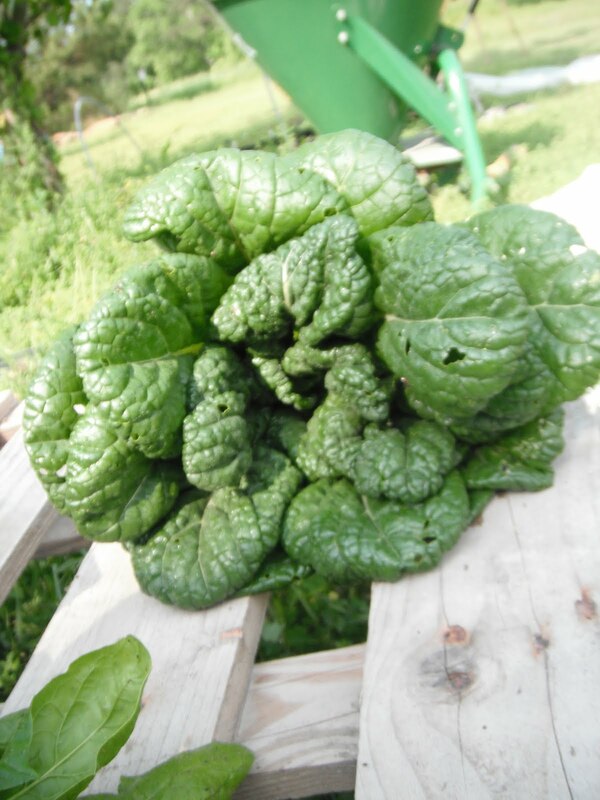 Steam or parboil the spinach until it wilts. Cool it under cold water, squeeze it dry, and chop. 2. Melt the butter in a 4- to 6-quart saucepan over medium heat. Add the spinach, salt, pepper, and nutmeg. Add the stock and bring it to a gentle simmer. Beat the eggs with half the Parmesan and add them to the soup. Cook, stirring occasionally, until the eggs are cooked and soup is thick. Serve with break, passing the remaining Parmesan at the table. Heat the oil in a large skillet over medium heat. Add the garlic and cook until it begins to color; add the remaining spice and cook, stirring, until the mixture is fragrant, about 1 minute. Add the turnip greens, the potatoes, and the stock or water, stir, cover, and reduce the heat to medium-low. Cook, checking and stirring every 3 or 4 minutes, until the potato is tender, 10 to 15 minutes. Raise the heat to high and boil off excess liquid, if any. Season to taste, drizzle with vinegar, and serve immediately. 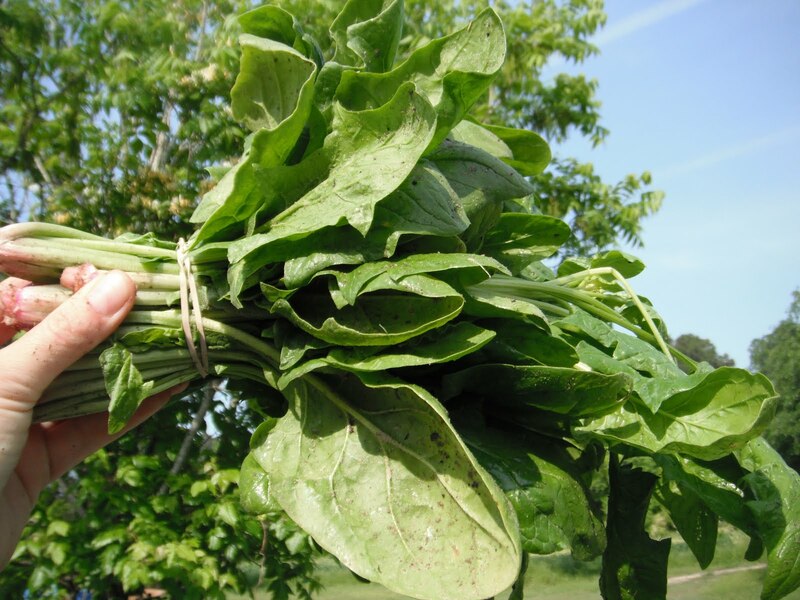 You can also use collards, cress, dandelions, kale, mizuna, mustard, tatsoi or bok choi. I usually decide on what to use depending on, first, what we have and need to use and second, depending on what I flavors I want in my meal. A lot of times, I just throw all the greens together, since we almost always wind up taking at least a few greens back home from the CSA drop or from market – even after donating to the Interfaith Food Shuttle. Well, hopefully I’ve given y’all some ideas for how to start using your greens. If you have favorite things to do with your greens, please feel free to post your recipes or send them my way via e-mail at parker.patricia@gmail.com. 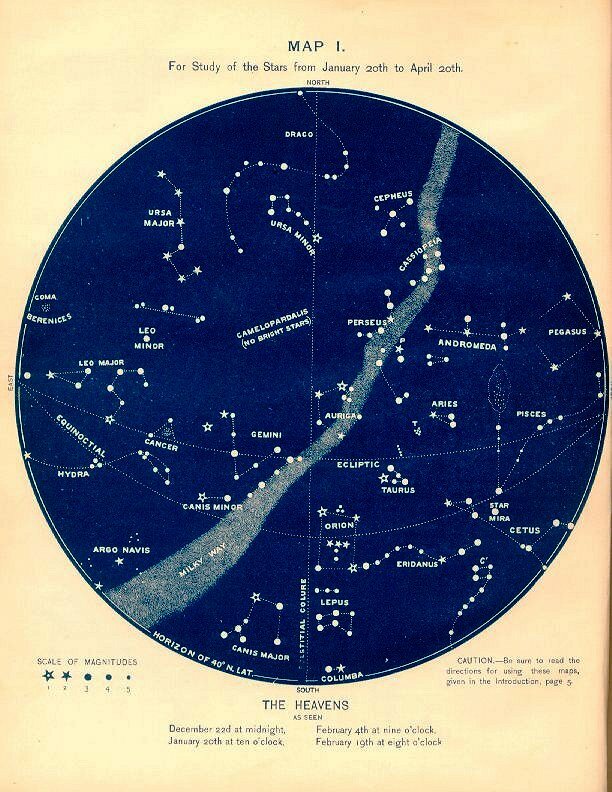 Also, please do check out the links at the right side of the page under the heading “labels”. There are a number of recipes and I tried to always label what was used in those recipes, so they’d be easy to search. 1. Dice tomatoes. Reserve about half for garnish. 2. Chop, slice or dice remaining vegetables (with peels on). 3. Brown beef with onions and garlic (or just onions and garlic with oil if you’re not using beef). 4. Add vegetables (eggplant first); let cook until tender. 5. Toss sauce and pasta. Add salt, pepper, raw diced tomato and fresh chopped basil as garnish. 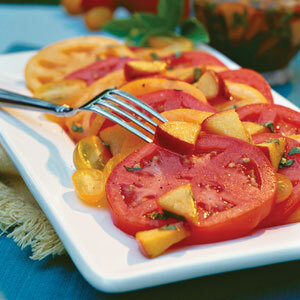 you say tomato…i say YUM! 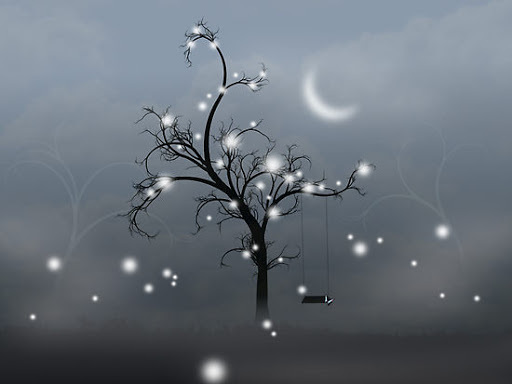 Hi everyone out there in cyberspace (wow – remember when that term was used regularly?!). I hope you’re having a fabulous summer and keeping as cool as you can. We’re still sporting our multi-bandanna stylee and drinking lots and lots of water to keep hydrated. Life is good – and it would be even better if it would only rain! Yesterday I drove from Chattanooga back to Raleigh. The rain followed me the whole way…well, not the whole way – it followed me until about Durham and then it just stopped. We managed to get a few sprinkles but we didn’t get much. The bright side though was that it was our friend Josh’s 4th birthday yesterday and he wanted fireworks to celebrate. The rain would have put a damper on a very cute and funny little boy’s birthday – so I guess we can’t be too upset about its absence ;). So, I realized I haven’t posted many recipes lately (or posted much all summer actually)…so I’m going to use the rest of this blog for exactly that. Right now we have tomatoes, summer squash, onions, potatoes, purple peppers, cucumbers, basil, and a few melons and eggplant (more of those to come soon). As usual, please feel free to post your own recipes to the comment box below or e-mail them to me at parker.patricia@gmail.com. 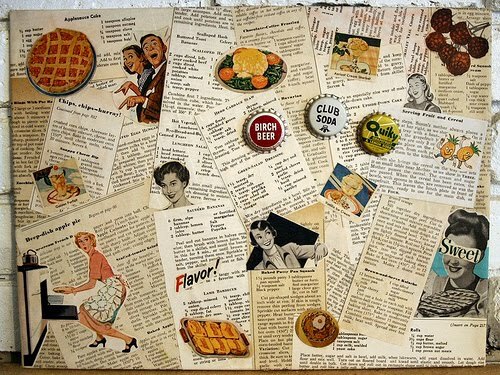 We would love it if you shared some of your recipes with us! 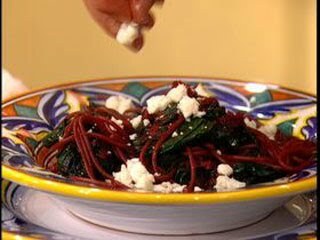 Here’s a basic summer spaghetti recipe. Our CSA members are receiving a TON of tomatoes this week – and even though they’re amazing all by themselves, I figured some of you might want a little more variety in your lives – especially as you continue to get more and more of them. I found this recipe on a blog called Closet Cooking. You can access the link to the recipe here. It’s easy and tasty – you can’t go wrong. 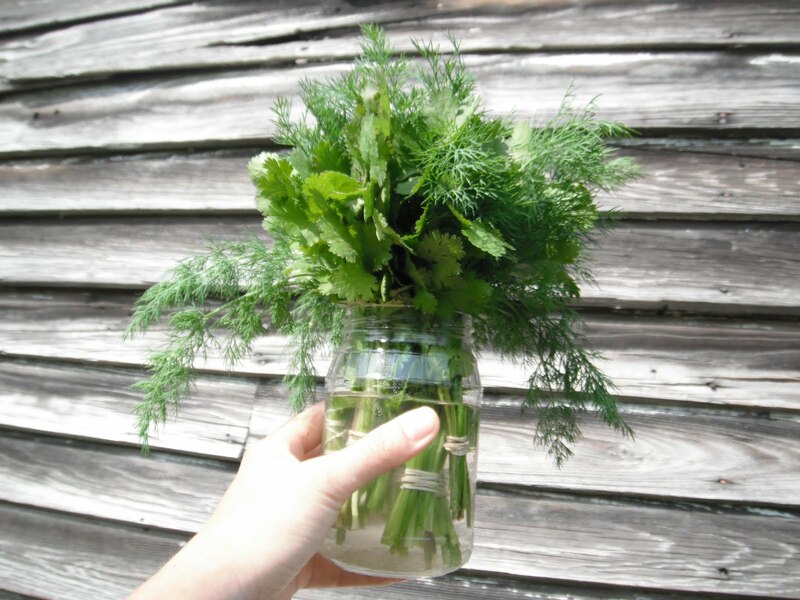 Of course, vary according to taste and what you happen to have in your kitchen/garden. 2. Saute the garlic until fragrant, about 30-60 seconds. 4. Add the pasta, tomatoes, basil, parsley, salt and pepper and toss to mix. 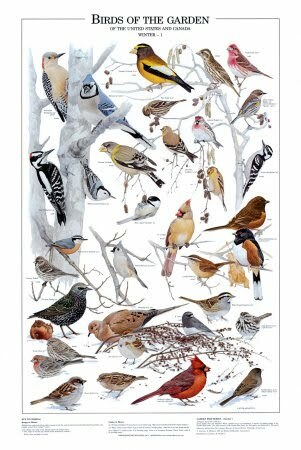 This one came from Southern Living (here). You can get peaches at the Western Wake Farmer’s Market from Clayton Orchard. This is another simple one – but feels and looks like it came from a fancy schmancy gormet restaurant. 1. Whisk together first 5 ingredients until sugar is dissolved. Whisk in olive oil. Stir in chopped peach and basil. Serve immediately. This one calls for tomatoes and squash – it’s a tomato and squash gratin. You can access the original link here. Place one layer of sliced squash in the bottom of a 9 x 13 inch baking dish. Top with a layer of sliced tomatoes. Season with salt and pepper and a few basil leaves. Generously drizzle olive oil over all and sprinkle a little Parmesan cheese on top. Repeat in the same order until you run out of vegetables. Top layer should be tomatoes. Add a final toss of Parmesan and a generous coating of breadcrumbs and more olive oil. Bake until everything is soft, bubbly and brown on top (about 30-40 minutes) Serve as a side dish with whatever you’re grilling or with a bean salad or pasta dish for a complete meal. 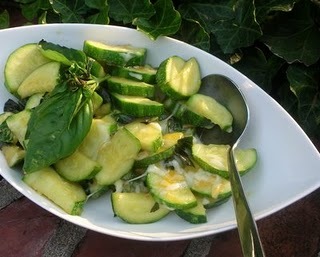 This one’s called “Mom’s Summer Squash” and it’s from Simply Recipes. You can access the original posting here. 1 Put onion, garlic, squash, bell pepper into a large saucepan with a couple of tablespoons of olive oil. 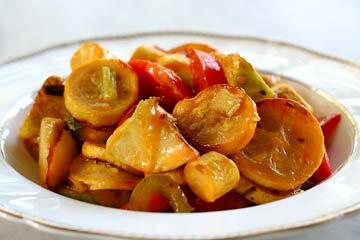 Put on high heat and brown the vegetables slightly to develop flavor. 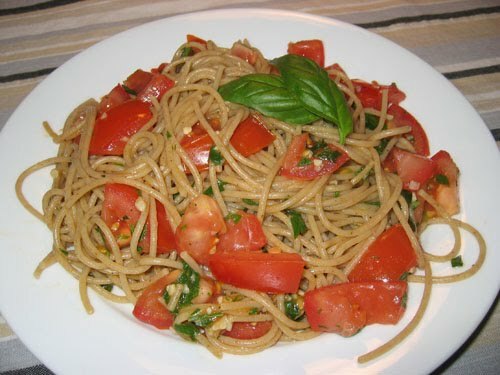 As you are browning, sprinkle either dried basil or chopped fresh basil on the vegetables. When vegetables are slightly browned, remove from heat, add the slices of cheese, and cover the pan. 2 In a separate stick-free fry pan, put the tomatoes and cook at medium hi heat for about 5 minutes, stirring occasionally. You want to let the juice from the tomatoes evaporate some. After 5 minutes, add the tomatoes to the rest of the vegetables and stir. Salt and pepper to taste. 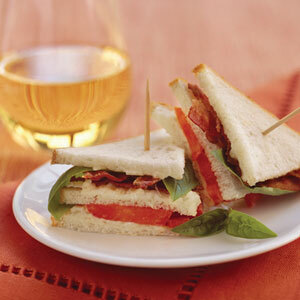 This one’s a variation on the classic BLT – it’s a BTB (bacon, tomato and basil). This recipe is from Southern Living and you can access the original posting here. 1. Heat bacon according to package directions until crisp. 2. Stir together cheese, mayonnaise, and garlic. Spread mayonnaise mixture evenly onto 1 side of each bread slice. Layer 3 bread slices, mayonnaise sides up, with 3 bacon slices each. Top bacon evenly with 1 bread slice, tomato slices, and basil. Top each with remaining bread slices, mayonnaise sides down. Cut each sandwich into quarters. Alrighty – hope y’all try out some or all of these recipes and enjoy ’em. As usual, thanks for stopping by! 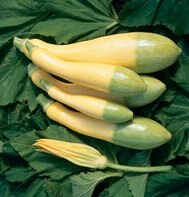 Most of us are familiar with standard crook neck yellow squash and basic zucchini. These types are what are typically offered at most grocery stores. 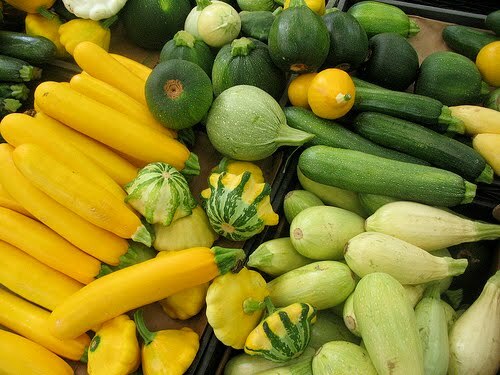 But take a stroll through any farmer’s market when summer squash is in season, and you’ll realize they come in so many more colors and shapes. In case these different varieties are new to you, I’m going to introduce you to a few different varieties. This little zucchini is called eight ball. 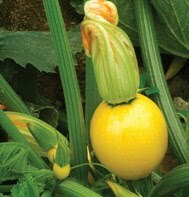 This is a yellow zucchini variety called floridor. 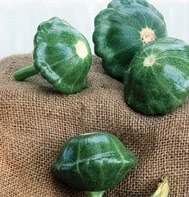 This is a patty pan squash called flying saucer. And here’s another patty pan called star ship. These are just a few of many different kinds of squash. 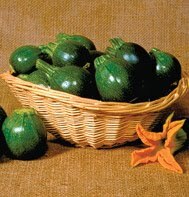 They are not only beautiful, they taste really darn good too!When it comes to eating these different varieties, you can treat them as you would your more typical summer squash. The round and patty pans types just call for different slicing methods – but there are no hard and fast rules about how. I like to cut the patty pans in wedges. 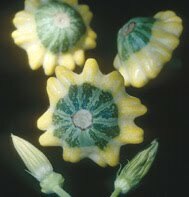 You can also stuff patty pans. I like to slice the ball varieties into large circle slices. Others like to chop these into cubes. 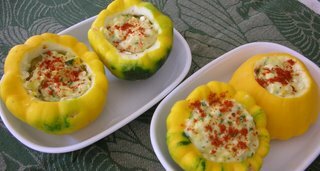 Here’s an awesome stuffed patty pan recipe (but you could use other varieties and you could change up the stuffing) I found on A Veggie Venture‘s website here. It’s an awesome site.You’ll have to follow the link to get to the recipes, but here’s what it looks like (yum!). Here’s another one from The Veggie Venture site. It’s basic, easy and yummy. You can access the recipe here. Well, it’s time to get back to packing. Ben and I are moving out to the farm in Clayton next week. We’re pumped – but now that the packing has begun, and the move is in transition, it’s starting to feel a little weird leaving. This is where Ben and I first moved and lived together (he from NYC, me from TN). We have awesome neighbors. We love this neighborhood. We love the people. We’re definitely going to miss living here. But we’re also SO looking forward to moving out to the country. And living ON the farm!!! *Sigh* It’s been good here and it’s going to be good there.And I’m really looking forward to seeing lightning bugs blinking whole fields with light. See y’all Tuesday at pick up and Saturday at market. Have a great week! (Revision: See y’all Wednesday and Saturday – the trucks are stuck – CSA drop is re-scheduled for Wednesday). I told a few of you I would share this recipe. I found it in the March 2010 issue of Prevention. We haven’t had a chance to try this recipe yet, but it sounds really yummy and we’re gonna give it a try this weekend. The recipe calls for bacon, but I think it would be just as good without it, substituting sunflower seeds (or your favorite nutty topping) instead. 1. HEAT oven to 400F. Put sweet potatoes on backing sheet, drizzle with 2 tablespoons of the oil, sprinkle with 2/4 teaspoon of the salt, and toss to coat. Roast, turning occasionally, until crisp and brown outside and just tender inside, about 30 minutes. Remove from oven but leave on pan until ready to use. 2. COOK bacon in skillet over medium heat while potatoes raost, turning once or twice, until crisp. Drain on paper towels and pour off fat, leave any darkened bits in pan. Chop bacon. Put pan back over medium heat and add remaining 2 tablespoon oil. When hot, add bell pepper, onion, ginger, and remaining 1/4 teaspoon of salt. Cook, stirring once or twice, until no longer raw. Stir in cumin and bacon. Stir in organge juice and turn off heat. 3. PUT spinach in large bowl. Add sweet potatoes, warm dressing, and freshly ground black pepper to taste and toss to combine. Taste and add salt if needed. 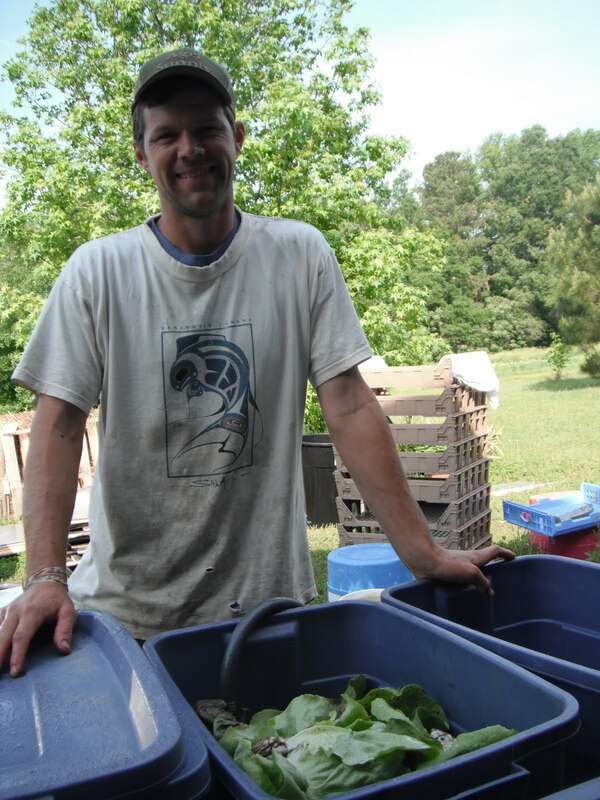 This coming Tuesday, February 16th, we plan to have produce pickup at our house, 604 Sasser St., between 4:00 to 7:30 pm. The next NCSU delivery will be Wednesday, February 17th. Remember to have your orders placed by Monday evening. During these cold winter months, please be aware the weather may postpone our harvest of your produce. In response to this, we may postpone pickups by a day or two. We will provide primary notice of pickup changes via email (especially for those of you who place orders) as well as via blog and online store. Thank you for being flexible with us! 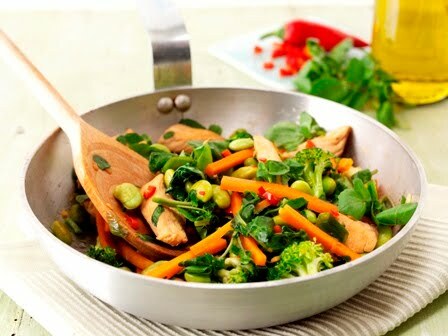 Heat oil in wok or deep fry pan add salt and all vegetables and stir frequently. Add soy sauce and wine; continue to stir and then add water. Stir frequently. Cover 2-3 minutes until vegetables are desired consistency. Serve over rice. Hi ya’ll! I hope everyone is having a fun and safe Monday afternoon. I am getting quite a bit of work done for classes, but became distracted by the thought of posting this request – which is basically to ask those of you who have made tasty treats with Ben’s Produce to please share your recipes or ideas with us. If you are interested in sharing, please post your recipe/ideas as a comment here or send an e-mail my way (parker.patricia@gmail.com). I will compile the recipes and share them in a blog post. If your recipes come from a source other than youself, please include that as well (if you know it). As usual, thanks for stopping by! We’ll see you all later this week. Heat 1 tablespoon EVOO in Dutch oven over medium-high heat. Season the chicken with salt and pepper, then brown until golden, 3-4 minutes on each side. Remove the chicken and add another tablespoon of EVOO to the pan, one turn of the pan. Add the onion, parsnips and carrots and season with salt and pepper. Cook to soften a bit, 5-6 minutes. Add the kale to the pot and wilt in, then add the nutmeg. Whisk the mustard, molasses and stock together in a bowl, then pour over top of the vegetables and settle the chicken back into the pot. Bring to a boil, then reduce the heat to medium-low; cover and cook for 15-20 minutes. Remove the lid, then remove the chicken and reserve on a plate covered with aluminum foil. Continue simmering the veggies until the liquids are thickened, about 10 minutes. 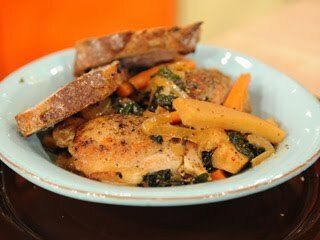 Serve the chicken and veggies with crusty warm bread. Heat oil in a Dutch oven; add bacon, and cook until crisp. Add onion, and sauté 5 to 7 minutes or until tender. Add garlic; sauté 1 minute. Stir in collard greens, salt, and pepper; sauté over medium heat 5 minutes or until greens wilt. Stir in chicken broth. Reduce heat to medium-low; cover and cook mixture 45 minutes or until greens are tender. Pour greens mixture through a wire-mesh strainer into a container, reserving greens and pot liquor. Whisk molasses and butter into pot liquor. 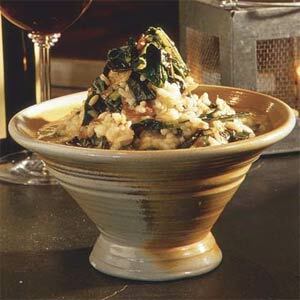 Place 1 cup Collard Green Risotto in each of 6 bowls. Ladle pot liquor mixture evenly on top. Serve immediately. This recipe was originally taken from one of the Moosewood cookbooks. If you’re not familiar with these books and you would like to add more veggies into your diet, I strongly suggest checking them out at one of our local bookstores. This recipe calls for spinach, but you could just as likely use tender kale or vitamin green instead. Slice the Tofu lengthwise into 4 rectangular slabs, than half each piece to get squares. Spread the sesame seeds on a plate. Press all surfaces of each tofu square into the seeds to coat. Heat the sesame oil in a large skillet on medium heat. Arrange the tofu in a single layer and cook about 5 minutes Carefully turn and cook 5 minutes on other side. Add soy sauce and Tabasco, turn the squares over, and cook another minute. Transfer squares to a plate (leaving stray seeds in the pan). Add the oil and garlic to the pan and sauté for about 30 seconds, until golden. Add the still damp rinsed spinach and cook for 1-2 more minutes, stirring constantly. Cook until wilted but still bright green. 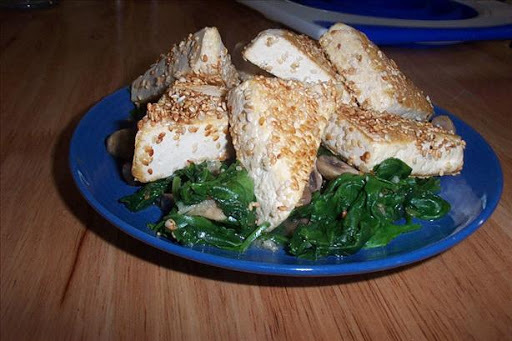 Serve the tofu on top of the spinach. Before Ben started farming full-time, there were a TON of foods I’d never tried or cooked. While I’d had beets in my life, I’d always had them straight out of the can. The only way I ever ate them was from the can, with chopped raw onion and vinaigrette dressing. It’s yummy – but I had no idea how much better FRESH beets were. I also had no idea how potent they are – in flavor as much as in color. One of the first good things to know about preparing beets is how to wash them. When you wash them, you want to be delicate with them. If you use a brush, you will puncture the skin and the gorgeous color will bleed. I wash them thoroughly with my hands under running water and that does just fine for me. They’re organic, so I’m not that concerned about cleaning them, I just want them to be dirt free. 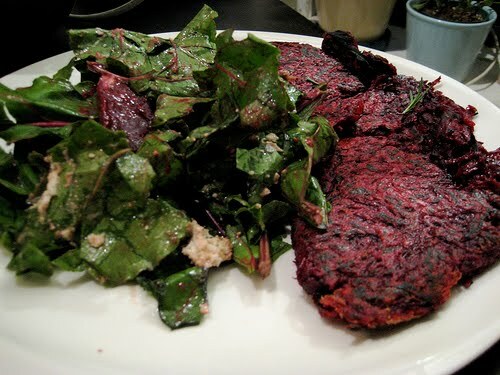 I thought I’d include some of my favorite beet recipes and other recipes I’d like to try soon. 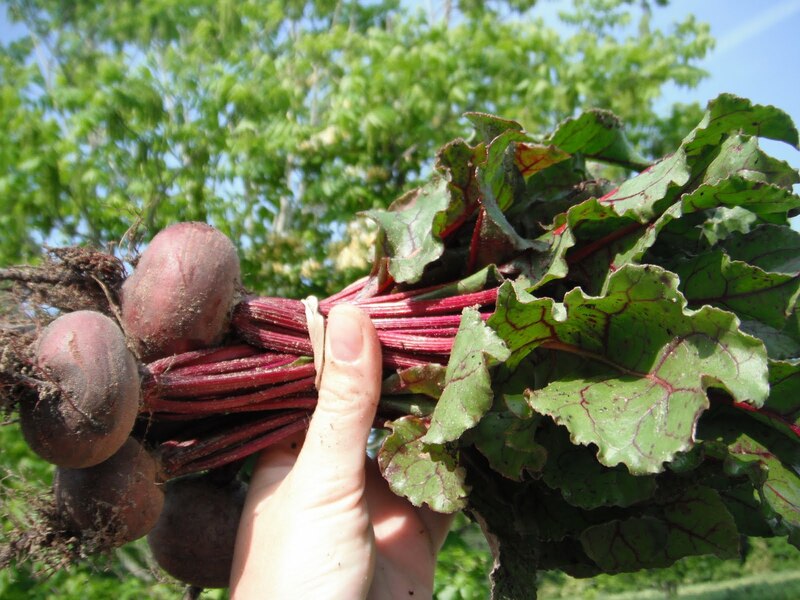 Soooooo…here we go with the beets and more! NOTE: As you look over these recipes, by all means, feel free to modify them. One reason Ben is the baker and I’m the dinner cook is because I sort of improv what we have in the fridge with recipes that sound good while Ben actually follows the directions – I’ve never really been good with that – at least not when it comes to cooking :0). Experimenting with food is FUN – I hope these recipes give you some ideas and a happy party in your tummies. 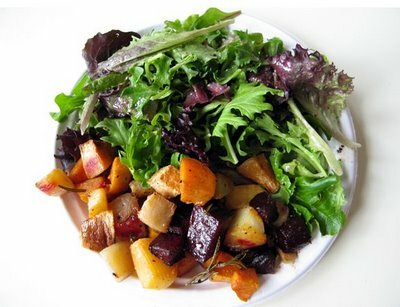 Prepare ahead the roasted beets and dressing can be refrigerated separately for up to 1 day before combining. 1. Preheat over to 400F (200C). Place the beets in a roasting pan. Add 1/2 cup water and drizzle with the oil. Season with salt and pepper. Cover the pan with aluminum foil. Roast about 1 3/4 hours, or until tender. 2. Uncover the beets and let cool. Peel and dice the beets (NOTE: peeling beets is more an aesthetic thing than a necessity – I keep the peels on [especially when they are baby beets]). 3. Whisk the vinegar, mustard and honey together in a small bowl, then whisk in the oil. Combine the beets, onions, and dressing in a bowl and toss. Sprinkle the arugula, feta, and mint over the top. Toss gently, and season with salt and pepper. Serve immediately. – Good with grilled lamb or steak, or on its own as a light lunch. 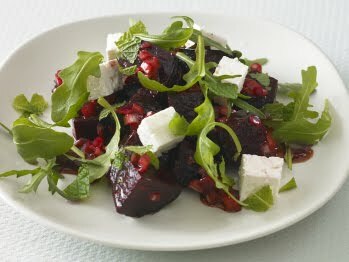 Variation: Roasted Beet and Goat Cheese Salad. Substitute a firm, crumbly goat cheese for the feta. 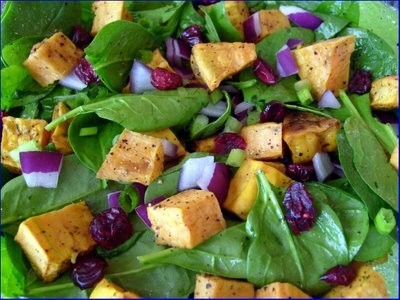 Scatter the salad with 1/4 cup pomegranate seeds or toasted pine nuts. Put all the vegetables and the herb sprigs in a large baking dish. Season well with salt and black pepper, drizzle generously with olive oil, and toss them with your hands to coat them evenly. Put the baking dish in the preheated oven and cook, stirring the vegetables occasionally, until they are tender and golden brown, about 45 minutes. 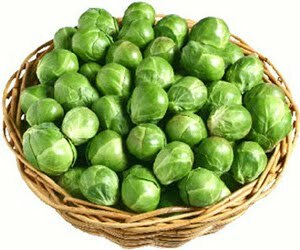 Serve the vegetables from their baking dish or transfer them to a platter to accompany a roasted main course. optional: any other vegetables desired! put in what you have (as long as the veggies together make sense). We’ve made pot pie with baby beets before – it was yummy :). 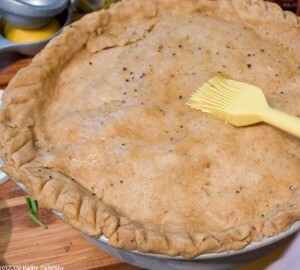 Mix the vegetables together and place in bottom of pie crust. Combine oil, water, tamari, nutritional yeast and pour over vegetables then put top crust on. Back at 375 for 45 minutes or until the filling is bubbling and the crust is golden. 1. To make the filling, heat the oil in a frying pan over medium-low heat. Add the leek, mushrooms, and celery and cook, stirring often, for about 5 minutes, until softened. 2. Remove from the heat and stir in the bread crumbs, egg, parsley, lemon juice, and ground coriander. Season with salt and pepper. 3. Preheat the oven to 325F (160C). Oil a 13x9in (33x23cm) baking dish. Cook the cabbage leaves in boiling water for 2 minutes, until pliable. Drain and rinse under cold water. Pat dry. 4. Lay each leaf flat and divide the stuffing among the leaves. Roll up each leaf, folding in the sides to enclose the filling in a neat parcel. Place the rolls, seam side down, in the dish. Pour in the stock. Back for 45-55 minutes, until teander. 5. Meanwhile, heat the oil in a frying pan over medium heat. Add the onion and garlic and cook, stirring occasionally, about 5 minutes, until softened. Stir in the crushed tomatoes. Reduce the heat to medium-low and simmer about 10 minutes, or until lightly thickened. Season with salt and pepper. 6. 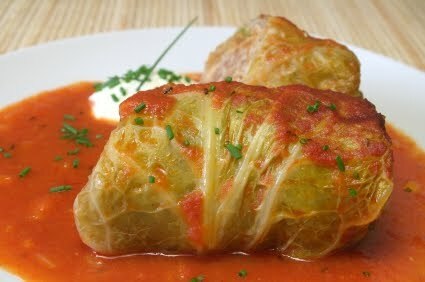 Using a slotted spoon, serve the cabbage rolls on diner plates, with the remaining tomato sauce passed on the side. Good with crusty bread, sauteed potatoes, or brown rice. 1. Trim the stems from the brussel sprouts and cut and X into the base, about 1/4 inch deep. 2. In a small bowl, combine the wine, honey and soy sauce and stir together. 3. Over moderate heat, melt the margarine in a 3-quart saucepan. Add the wine and honey mixture, the water, and the brussel sprouts. Stir together, then cook, covered, at a gentle simmer for 15 minutes, stirring occasionally. Uncover and cook, stirring occasionaly, for another 10 minutes. 4. Dissolve the cornstarch in a small amount of water. Stir into the saucepan quickly, then cook for another 5 minutes. Remove from heat and transfer to a covered casserole dish to serve. Keep the heat moderate — cooking too quickly will burn the sugary outside of the pancake while leaving the inside raw. And don’t forget to wear an apron when you’re grating the beets. 1. 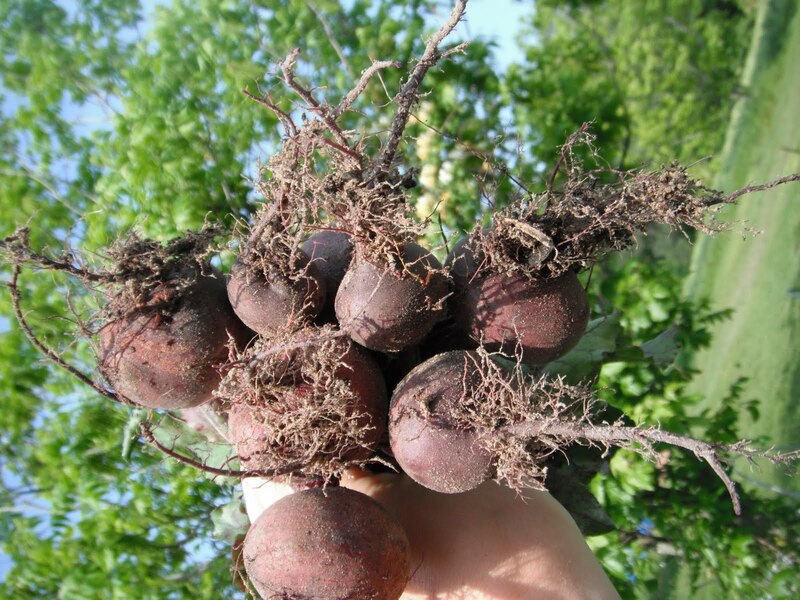 Trim beets, and peel them as you would potatoes; grate them in food processor or by hand. Begin preheating 12-inch nonstick skillet over medium heat. 2. Toss grated beets in bowl with rosemary, salt and pepper. Add about half the flour; toss well, add rest of flour, and toss again. 3. Put butter in skillet; heat until it begins to turn nut-brown. Scrape beet mixture into skillet, and press with spatula to form a round. With medium to medium-high heat — the pancake should gently sizzle — cook, shaking pan occasionally, until bottom of cake is nicely crisp, 8 to 10 minutes. Slide cake onto a plate, top with another plate, invert the two plates, and return cake to pan. Keep cooking, adjusting heat if necessary, until other side is browned, another 10 minutes or so. Garnish, cut into wedges, and serve hot or at room temperature. Place a large pot over high heat and add the wine. Fill the rest of the pot with water about 1/2-3/4 of the way up the sides. Bring to a boil, add some salt and the pasta. Cook pasta until al dente according to the instructions on the box. Reserve 1-2 cups of the cooking liquid when you drain it. While the pasta is cooking, place a large skillet over medium-high heat with the EVOO. Add the garlic and the grated beet, season with a pinch of nutmeg, salt and pepper, and cook for 2-3 minutes. Add the swiss chard to the pan and cook for about 4-5 minutes or until it starts to wilt down. Add the drained pasta to the skillet, season with salt and pepper and toss it around to combine. Add some of the reserved pasta water if you like the sauce more loose. Crumble the ricotta salata on top and serve. In addition to being tasty, kale is a good source of lutein, benefiting eye health, and vitamins A and C. Serve as a side dish with steak or roast chicken, or enjoy two turnovers as a meatless entrée. They are great made ahead and brown-bagged; reheat in a microwave or toaster oven. Heat olive oil in a large skillet over medium-high heat. Add onion; sauté 10 minutes or until tender and lightly browned. Add garlic; sauté 2 minutes. Add kale and spinach; sauté 8 minutes or until kale is tender. Stir in pepper, salt, and nutmeg. Remove from heat; cool slightly. Stir in feta. Separate dough into 8 pieces. Roll each dough piece into a 5-inch circle. Spoon about 1/3 cup kale mixture on half of each circle, leaving a 1/2-inch border. 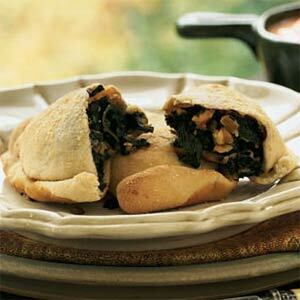 Fold dough over kale mixture until edges almost meet. Bring bottom edge of dough over top edge; crimp edges of dough with fingers to form a rim. Place turnovers on a baking sheet coated with cooking spray. Lightly coat turnovers with cooking spray; sprinkle each turnover with about 1 teaspoon Parmesan. Bake at 375° for 18 minutes or until golden brown. Let stand at least 5 minutes before serving; serve warm or at room temperature. Drain the tofu, cut into cubes and mash. Wash and prepare the vegetables. Combine the tofu with the remainder of the ingredients and seasonings. Lay out one of the gyoza wrappers in front of you. Dip your finger in the water and moisten the edges of the wrapper. Place a heaping teaspoon of filling in the middle of the wrapper. 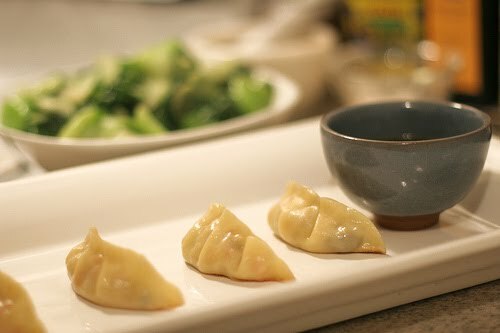 Fold the gyoza wrapper over the filling and pinch the edges to seal it shut. (You may want to use a cornstarch/water mixture to make this easier). Heat 2 tablespoons oil in a large skillet or wok.When oil is ready, carefully add the dumplings and cook on high heat until golden brown (about 1 minute). Without turning the dumplings over, add 1/2 cup of water and cover. Cook for about 1 minute to cook the raw filling and then uncover and continue cooking until most of the liquid is absorbed. Serve the potstickers with the burnt side on top, with potsticker dipping sauce or soy sauce mixed with minced ginger for dipping. This easy Chinese recipe allows you to get all the nutritional benefits of bok choy in a simple, flavorful soup. Feel free to increase the nutritional value by using homemade chicken broth, or adding cooked chicken or raw, peeled shrimp. Bring the chicken broth to boil in a medium saucepan. Stir in the seasonings (the red pepper flakes, soy sauce, Asian sesame oil), and the chopped garlic. Add the bok choy. Simmer for up to 10 minutes, until the bok choy leaves turn dark green and are wilted and tender. Serves 4 to 5. This recipe is submitted by a reader, Linnie Williams.